Today marks the closest Full Moon to the Autumn Equinox (in the Northern Hemisphere) and is known as the Harvest Moon. This is a time to honor the fading bloom of Summer, and keep gratitude in our hearts as we move into the darker months ahead. In this ceremony we will be honoring the elements of creation; air, fire, water, and earth, and create a reading with your Spirit de la Lune deck for elemental balance preparing for the Equinox ahead. We will also connect to the magick and wisdom of the apple! First, separate the moon phase cards into their respective elements... you will be able to tell by the colored galaxy on each card. Air is the New Moon and Waxing crescent cards with the Air signs: Gemini, Libra, and Aquarius. The galaxy color is indigo/purple. Fire is the First Quarter Moon and the Waxing Gibbous cards, along with the Fire signs: Aries, Leo, and Sagittarius. The galaxy color is red/orange. Water is the Full Moon and Waning Gibbous cards with the Water signs: Cancer, Scorpio, and Pisces. The galaxy color is shades of blue. Earth is the the Last Quarter moon and the Waning Crescent along with the Earth Signs: Taurus, Virgo, and Capricorn. The galaxy colors is shades of green. What do I need to do or embody to bring balance to this elemental realm within me? Place the Harvest Moon card in the center to represent the Full Moon and the energy of this moon cycle. Take your time with the reading a journal about each message you receive. Write down ways you can actively bring this energy into your life. Which element do you really connect with? Which element intimidates you? In my personal reading my Air realm, or third-eye, wants me to keep creating; the fire within me wants me to explore and follow my curiosities (it is also my sun sign Sagittarius); Water wants me to listen to my intuition more; and Earth wants me to bring more support into my realm... everyday rituals that support my thriving, and also I need to support Gaia more. What do the elements have in store for you? Before you continue forward with the ceremony, create an affirmation, statement, or vow to yourself and each element. These are important for your Elemental offerings. Offering is at the heart of ceremony and ritual. It represents the cycle of giving and receiving and that all energy is borrowed. A heartfelt offering, filled with gratitude, is a deep surrender and devotion to the Divine and to Gaia. Now that we know what we must do for the elemental realms, and have consciously crafted our intentions and vows for each element, we offer our devotion and invoke the realms around us. The Apple is a sacred fruit to the elements. When we cut an apple from the middle, the seeds reveal their magick - the five pointed star, also known as a pentacle or pentagram. Each point represents an element: Air, Fire, Water, Earth and Spirit. 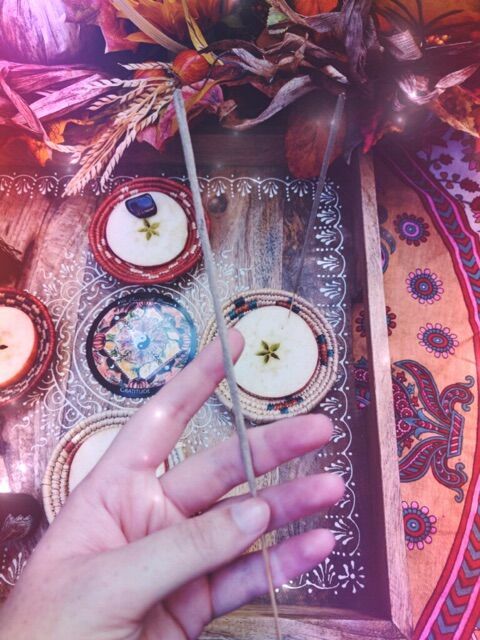 Light the incense and waft it around your apples, altar and your body. Stick it in the apple slice and call on Air and state your vow or intention aloud. Let the smoke carry your prayers upwards. Take your oil and anoint each chakra point on your body. Call in Fire and state you vow and prayers to Fire aloud. Place 5 drops of oil on you apple slice and light a candle if safety permits. Call in the element of Water with your intentions and vows... spray your apple slice and yourself with the water spritz, or alternatively drop the slice into your wine or moonwater and pour and offering out to the land and then take a sip yourself. Hold your crystal in your hands at heart level and call in Earth with your prayers and intentions out loud. 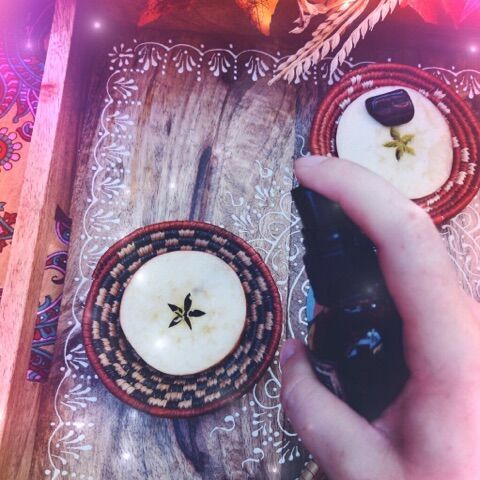 When you feel ready, place the stone on your apple slice. 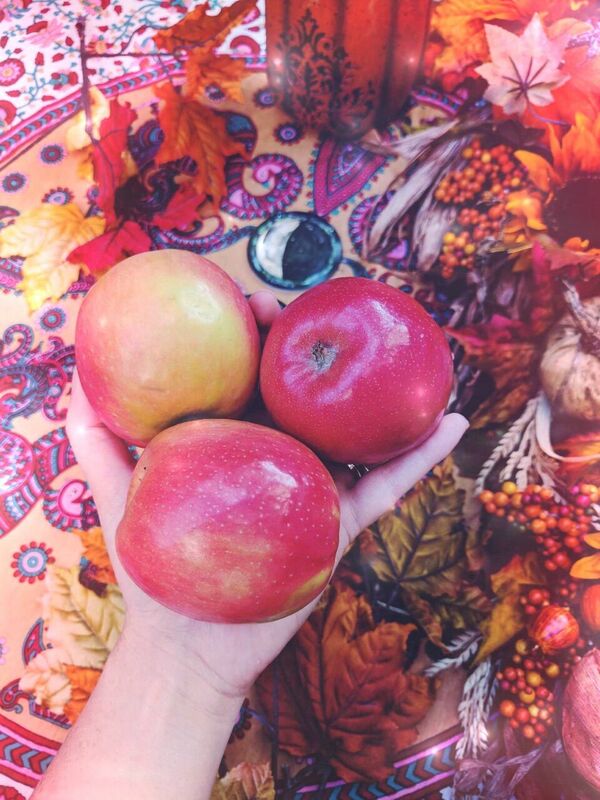 Apples are one of the sacred fruits of Autumn along with the Pomegranate. 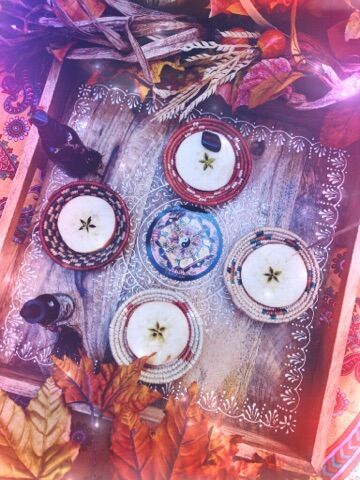 The Apple's wisdom of Elemental Magick, along with her potent energy of the Great Mystery and cycles of Gaia, make her the perfect fruit to use in this ceremony. After you create your Elemental offerings, take the remaining 3 apples and the offerings and place them out on the land somewhere. This is how they become an offering... it must be someplace other than your backyard or altar space. Offer up the elemental offerings first. You should now have your three apples left. The first apple represents the Fruits of Your labor. Meditate on your harvest this year so far. What have you accomplished? What are you proud of? What new projects are you excited about? Infuse all of this into your apple and offer it out to the land to your higher self and Spirit. The second apple represents all the lessons you have learned thus far. What lessons and obstacles helped you make it this far? Infuse this apple with your sacred lessons and this time, eat it! Eat it,, and integrate these lessons into your cells. The third apple represents your blessings and gratitudes. What are you thankful for? What makes you pinch yourself with awe and amazement? Who are you grateful for in your life? What makes your life better? What and who do you love? Infuse this apple with this beautiful energy and take it with you. Keep it on your altar as a daily reminder of your blessings. When it is ready top be disposed of... bury it in the earth. Feel free to split this ceremony up into parts... you could even do the elemental offerings on the actual day of the equinox, September 22nd, and the Three Apples on the Full Moon. 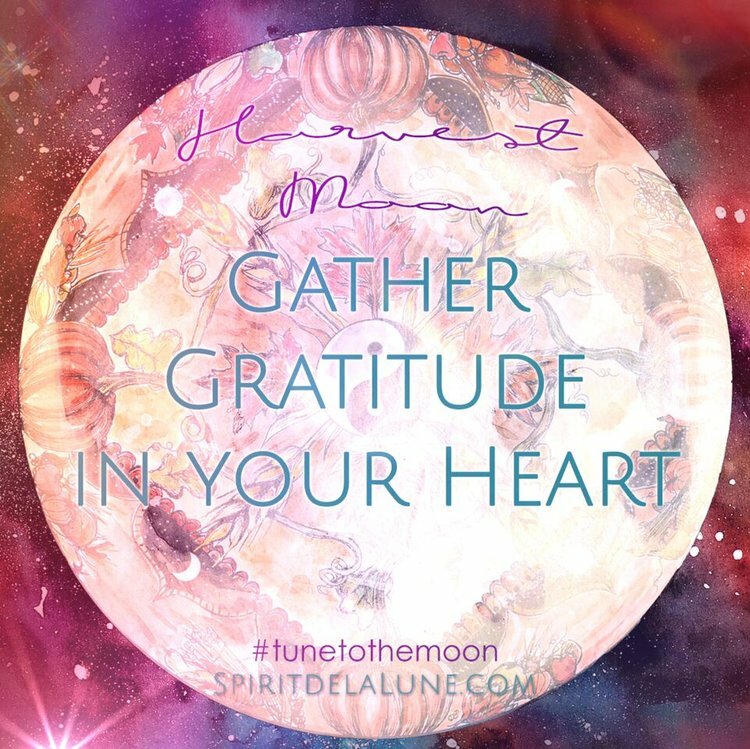 Follow your intuition and remember to offer with a grateful and joyful heart! This is a wonderful time to create moon water and charge your crystals and cards out under the Full Moon! Please share your elemental readings and ceremony with us by tagging @spiritdelalune in your photos! We would love to see your magick! We hope you have a beautiful Harvest Moon filled with joy and blessings!